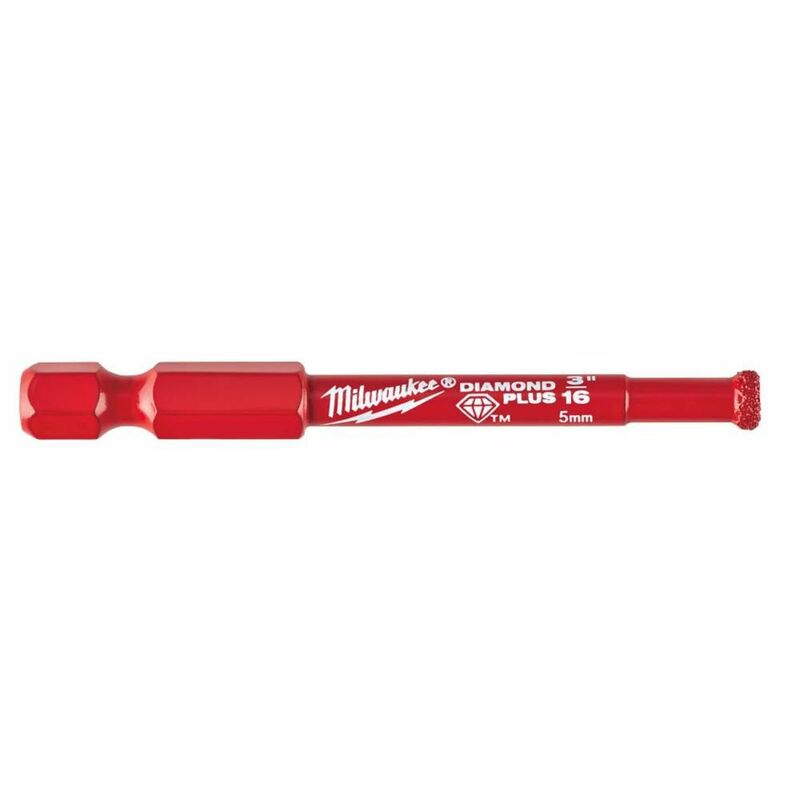 3/16 Inch Diamond Plus Hole Saw Choose the Milwaukee<sup></sup> Diamond Plus Hole Saw for up to 10X longer life when cutting tile, stone and glass. Diamond Plus Hole Saws deliver best-in-class performance, with higher grade diamonds for maximum heat and fracture resistance. An improved braze provides superior diamond retention when cutting hard, abrasive materials. The One-Piece Hole Saw has a 1/4" quick change hex shank and features a large slug ejection slot. Designed as the single cutting solution for all tile, stone, and glass applications, Diamond Plus offers the lowest cost-per-hole on the market. 3/16 Inch Diamond Plus Hole Saw is rated 3.9 out of 5 by 138. Rated 5 out of 5 by Shoug from Worked great. Take it slow with minimal pressure and keep... Worked great. Take it slow with minimal pressure and keep water on the cut. Drilled through 1” thick granite slab 4 times and still has plenty of life left. About 30 minutes a hole using a dewalt cordless drill. Final holes ended up slightly larger than 3/16 but still fine for what I was doing. Rated 5 out of 5 by StretchingZero from I used this bit in a standard 18V cordless drill... I used this bit in a standard 18V cordless drill and it did the job in some very hard porcelain tile.I first tried a carbide-tipped masondry bit in a corded hammer drill. It took much, much longer and the bit lasted for only 1 or 2 holes.This diamond bit took much less time and is holding up. Rated 4 out of 5 by Ryan from It worked good but it was put to the test... It worked good but it was put to the test on the porcelain tile I had drill into, though i did burn out a couple masonry bits. It really wondered about when starting to drill the hole so I had to use a different bit as a starter hole. Rated 1 out of 5 by Cappy from Flattened out when drilling 1st hole. Flattened out when drilling 1st hole.